Q&A: "Do Twin Flames Share the Same Higher Self?" Your Unique Codes – What Level Of Existence Are You At? Higher Selves, Oversouls, Lovers… Plus, Did You Know A Part Of Your Twin Is With You Wherever You Go? Before we start today, let me remind you that if things haven’t been ideal for you in recent times, it doesn’t have to be that way! Your journey can really be lifted into a state of love and unity – it’s why you came here! But in order to get to that point of harmony, you might have some work to do on clearing out the negativity you absorbed from others’ during your lifetime. Watch a video here on why so many Twins experience struggles and how to resolve it. Thousands of Twin Flames have already benefitted from the Free Downloads in my Twin Flame Help Kit, so make sure you Download my Free Energy Cleanse Tool and Guided Meditations For Twin Flames if you haven’t already done so! Just add it to cart for free in the store! Thank you for this interesting question! I’m happy to get to answer this as it’s something quite a few Twins ask me on a regular basis. The answer is, no. Twin Flames do not share a higher self per say, but there is a unified “oversoul”. Let me explain in “real world terms”. Think of us all like storeys of a building. We all live in a house that’s many storeys tall but we only usually spend time in a few of the lower levels. The top levels of your “house” are a higher vibration than where your human consciousness resides. Up there is where your “higher self” resides – and above this, you and your Twin Soul’s shared “oversoul”. And these storeys continue up into pure light, up towards where you become source consciousness and it becomes you. The higher up in frequency we go, the more unified things become. The unified field being pure source energy, where we ultimately all are “one”. 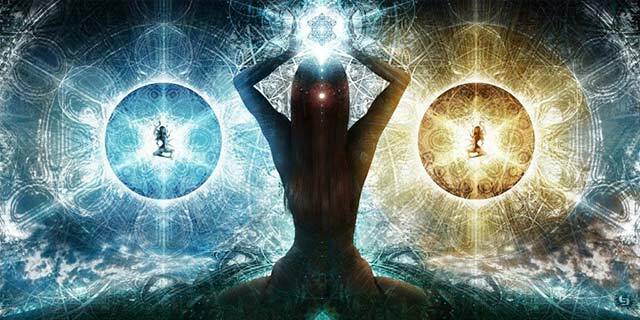 Twin Souls can be said to be the one “oversoul” divided – why we have an identical energy frequency. Think of it like this. Source is one – let’s call it 0 zero. As this divided itself over and over we got more and more varied and refined variations of this energy. So in the universe there are only you and your Twin soul who share the exact same energy frequency – let’s call it 026718964175487548375473245239 because you have a unique signature or “soul song”. You might meet others whose signature is nearly identical to your own (soul mates) and these share a “soul group” with you. Their number might be 035718964175487548375473245239 (two numbers differing). These people might be like your soul siblings or your soul cousins, but they’re not your identical Twin. And you might meet people who are very different from you, who are a part of a differing soul group. Their “number” would be completely different. What’s The Personality? Does Light Have Persona? So to return to your question proper – you and your Twin Flame do not share a higher self the way we usually refer to higher selves. When you interact with your Twin Flame’s higher self, it’s them. It’s him or her, not yourself in a human sense. You and your Twin Flame’s higher selves are not the same, on the level that we as human beings are able to interact with them. Your shared oversoul is the “same”, but is of such a high vibration that it will not be as recognizable as a “personality” to you. Try tuning in to see. It feels more like tuning into source or the universe… it’s very “pure”, high vibrational. It doesn’t have the “likes and dislikes” and personality traits of your earthly selves. Its priorities are much deeper and more eternal. So you can always interact with your Twin’s higher self. And it won’t be the same as your higher self, although with all twins there is a very strong similarity. You can also ask your own higher self to communicate with you. What really happens as Twins go through the Ascension process is we become more and more our “higher selves”. What has kept us in a low “ego vibration” starts to release and go, lifting us up. Now, remember the house with all the storeys? When we uplift through Ascension we begin to inhabit more and more of the higher floors. And love and harmony live up there. High up. So we begin to expand into the range of spirit, into peace, love, joy, expansion, pure potentiality. Twin Flame Union happens up there in the higher “storeys”. Interacting with your Twin Flame’s higher self is a wonderful way to strengthen the soul bond between you and trigger your Twin’s earthly self to “click into remembering” who they really are beneath it all. Your Twin’s higher self can also provide you with guidance, support and help you feel comforted and loved – especially on your journey back to each other. For more step by step info on how to begin communicating directly with your Twin Flame’s higher self – go to the article “A Message From Your Twin Flame’s Soul”, and have a look at “A Message From the Divine Masculine” and “A Message From The Divine Feminine”. Remember always that when connecting spiritually it’s essential to have a clear channel. When we’re congested energetically we cannot receive the information and often get ego thought forms and confusion show up in its stead. Raising your vibration and clearing your energy, and specifically clearing out your telepathic and clairaudient channels, is the fastest and most effective way to start communicating with your Twin Flame’s higher self and your own guidance teams. I share with you exact step by step methods to do this, plus simple exercises to strengthen your abilities and open your channel in a safe way (to avoid negative influence and ego interference). Have a look at the dedicated module for this in the Vibrational Alignment Program for Twin Flames. My own telepathy opened dramatically for the first time in life after I cleared my channels – I went from having had no prior “psychic abilities” to being able to converse telepathically with my Twin Flame within 2-3 months. A few months after this, I became able to communicate with my own higher guidance and assist others as well – this was the result of my channel being clear enough and my vibration being high enough to receive guidance. Discover what energy vibration you’re truly in, plus how to begin uplifting yourself into alignment with more love and harmony – go to this special Twin Flame assessment which will tell you where on the vibrational scale you’re at right now. Did You Know Your Higher Self Is Always With Your Twin On Earth? Another interesting fact about Twin Flames is that each Twin’s higher self is guiding the “lower self” of their counterpart. So, your higher self will be present with your Twin soul as a spirit guide in their life, while their higher self is closely involved with you from the spiritual realms. Like a criss-cross of guidance from one Twin to the other. Most Twin Flames have this soul contract, from the dawn of time, to take care of and watch over one another on this journey to earth. So your Twin Soul is always with you. Having said that, they will not step forward directly to communicate with you unless it’s an emergency or if you ask them for assistance. Thanks for this very interesting question, Becca! “I started with your free toolkit and immediately felt results so much that I had to get the full program and wow! I’ve been doing it consistently and I love the energy clearings and exercises. I feel lighter, and my lover and I are so much closer. Every day gets better and better.